If you’re looking for a fun and effective marketing promotion that’s sure to attract customers, maybe it’s time to create a new tradition using a popular holiday that’s become a springtime favorite around the country—Cinco De Mayo, the fifth of May. Food specials. There are many different kinds of Mexican cuisine that you can make: enchiladas, tacos, burritos, and fajitas. While it may not be your restaurant’s usual fare, maybe pick one or two dishes that you can make quickly and easily to tie in with your Cinco de Mayo promotion. Consider free food promotions, too. Create a mini taco station or nacho station with some fixings like cheese, beans, and ground beef, or hand out complimentary chips and salsa. If you have an outdoor area, consider setting up some food tents that carry different Mexican specialties, and include some drink pairings, too. Be sure to have folding tables on hand in advance to set up your event stations. Drink specials. Of course, Mexican-themed beers and other alcoholic beverages, like margaritas, should be on tap. Dos Equis, sangria, and tequila are all good choices. Give everyone a special price on these drinks on May 5—maybe tie in the number “5” into the prices ($5 margaritas, 3 beers for $5). Music and dance. Featuring live bands and DJs is a Cinco de Mayo tradition. A mariachi band or tejano music will add to the atmosphere. Many bands enjoy getting a restaurant’s patrons involved by teaching them some short songs and dances, handing out maracas, and asking everyone to sign and dance along. Family events. This year, Cinco de Mayo is on a Monday, which means that many places will be running weekend events to celebrate. During the day, attract families with the promise of face painting, small sombreros, maracas, and children’s Mexican dances. If there are other restaurants or bars in the area that are also running Cinco de Mayo specials, you may want to run a block party with an outdoor stage, different bands and singers, and games and prizes. 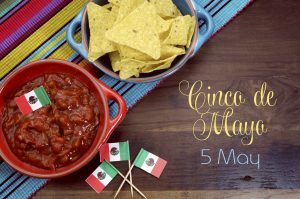 Remember to promote your Cinco de Mayo event on your website, and also by using social media outlets such as Facebook, Twitter, and Instagram. Offer Facebook coupons or “check-in” specials so that your customers’ friends know just where they’re going to be on Cinco de Mayo. The fifth of May is a great way to bring in new customers before the summer season starts! It’s that time of year again. Flowers are blooming, birds are singing, and your customers have an extra, “I’m so glad winter is over,” bounce in their step. Be sure to greet them with a fresh, clean environment that everyone can sing about. Time to roll up your sleeves and tackle the dirt and grime that have been building up all year long. Time for spring cleaning! When you drive up to work everyday, you might not notice all the details a first-time customer will see when they pull into your lot or walk up to your door. Make a good first impression by tidying up outside, adding a few welcoming spring flowers, or offering an inviting bench for patrons waiting on friends or family to arrive. Always make sure you have a convenient place for your guests to toss their trash, as well, so you can continue to maintain a beautiful entrance. Once inside, take a look around. Do you need new carpets? What about window coverings? How do your table linens look? It might be a good time to call your linen supply company and talk about how you can freshen up your interior. Also, evaluate your decorations and accessories. How regularly are those picture frames being cleaned? What about those plaques hanging near your doorway? Do you have other wall art or shelf decorations that need cleaned – or changed out for a more contemporary look? Now is a great time to redecorate and refresh your linens and other decor pieces. Do you remember the first time you watched Bar Rescue or Restaurant: Impossible and had a slight panic attack when the team revealed a layer of grease and grime on the bottom shelf behind the bar, because you couldn’t remember the last time you looked that closely at your own bottom shelf booze? Did you race to work the next day with a bucket in hand? Now’s the time to get down and get dirty. Really give your kitchen, prep, bar, and food storage areas a deep clean to remove anything that would embarrass you if Jon Taffer came walking through your doors, cameras rolling. In 2013, USA Today reported, “Some 50% of restaurant patrons who have a negative experience with a bathroom — from dirty toilets to grimy soap dispenses to bad odors — will blab about it to friends and family, according to a recent survey by Harris Interactive for SCA Tissue North America.” The evidence is real; a dirty bathroom means lost business and a filthy reputation. Cleaning a bathroom is a multiple-times-a-day activity at your bar or restaurant, but this spring, go beyond the surface. Look at tile health and clean the grouting. Tune up the toilets and faucets for efficiency. Clean the inside of the paper towel holders. Would your patrons enjoy a basket of might-needs on the counter? Do the baby changing tables need any TLC in both the women’s or men’s bathrooms? Review your vendor prices and Eco-friendly promises to make sure you’re still satisfied with their bathroom supply products and services. After all, the bathroom is perhaps more important than the kitchen in your customers’ eyes. Every year, you should inspect your restaurant furniture and foodservice equipment for signs of wear and tear. For example, make sure all the legs on wooden furniture are sturdy and tighten up any loose bolts. Check for scratches on metal frames and touch up with a can of spray paint. Repair any rips or tears in torn vinyl seats or upholstered restaurant booths. Ensure all of your kitchen appliances are running properly and efficiently. Be sure to take out of service any furniture or equipment that is no longer safe for everyday use and replace with safer products. Wooden table tops may need re-sanded, or outside teak furniture may need re-oiled. These items work hard for you, facing many rigors in a commercial environment, so it’s important you give them some TLC each year to increase their lifespan. Being fashion-forward, clean, and neat are important attributes for a waitstaff’s wardrobe. If you have veteran employees with older uniforms, be sure there are no rips, tears, or big, fat, ugly stains on their clothing. Make sure staff are equipped with the best aprons, chef gear, or company t-shirts, so your staff are always presenting the best image of your brand. Ask staff to do an inventory of their apparel for you, and make sure everyone has a clean, new-looking set of uniforms ready for when they head to work next! Cleanliness is an everyday priority at your establishment, and you teach safe practices at every opportunity. But organizing some refresher courses for staff will help reinforce the importance for everyone. Take the time to review cross-contamination prevention and proper hand-washing techniques, while also reminding staff of the right way to clean table tops, disinfect prep counters, and address regular bathroom check-ups. Spring is also a great season to review the cleaning products you’re using for each application for cleaning power, price, and convenience, and make sure to communicate which products your staff should use where. After completing these seven steps, you’ll be bragging to your Health Department officer and feeling really proud to serve your customers in a refreshed and germ-free environment. Go you!